Can the Bat come out and play? Harley Quinn in her classic costume from the animated series. Hand-sculpted statue by Clayburn Moore! Comes in a full-color, hand-numbered box with a certificate of authenticity. As many costume changes as Harley Quinn has gone through, we always come back to the harlequin suit she wore when she debuted in Batman: The Animated Series. Measuring approximately 12-inches tall, this fiendishly feisty sculpture captures her classic costume in the animated style. 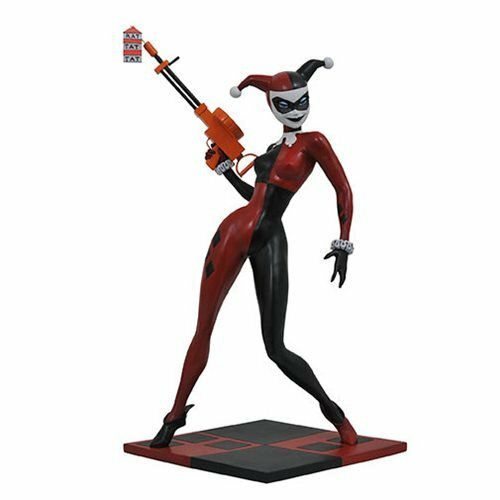 Hand sculpted by Clayburn Moore, the resin DC Premier Collection Batman: The Animated Series Harley Quinn Statue is a limited edition of 3,000 pieces that comes with a certificate of authenticity in a full-color, hand-numbered box.